It doesn’t matter how many ideas you have: all ideas have the same likely value. Sounds counter-intuitive… but take a look at the graph below. Rob Spencer, the data scientist at Imaginatik, distilled the chart from a specific innovation challenge that he was helping a Fortune 50 client with. The data is drawn from a large dataset, with the most prolific author contributing 360 ideas. Idea value = +1 for a positive conclusion and -1 for a negative conclusion. This isn’t a monetary value – you won’t get realized monetary value at this early ideation stage – but it is a good surrogate for value since it indicates the review team’s commitment to implement. The overall average idea value this organization is 0.14 which is quite typical across dozens of similar types of analytics Rob has conducted – e.g., this organization accepts a small fraction of ideas to explore further and rejects the rest. Each blue dot is a person, showing how many concluded ideas he/she had and their average value, as measured by material (potential) impact and ‘worth-while to explore’ further. The wide orange line is this 0.14 average; the thin orange line is a running average. 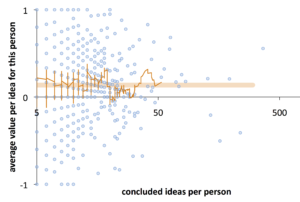 Value input is distributed across all ideas; no trend exists between the most prolific contributors (who put in hundreds of ideas) and the most limited contributors (those at the end of the long tail who put in just one or two ideas). Not incidentally, this observation challenges two opposing views one sees in the literature of innovation: some writers think that there are “idea people” who are both more prolific and better, and others suggest that it’s the rare fringe contributor who’s more valuable. Nope: all the same! How prolific you are doesn’t make your ideas better or worse. And we see the same pattern across job titles. The data speaks, and the insight is pragmatic: it also doesn’t matter where you are in the organization. Whether assistant to innovation senior vice president, on average, the ideas have the same (potential) value. Hmmm… now that’s noteworthy. 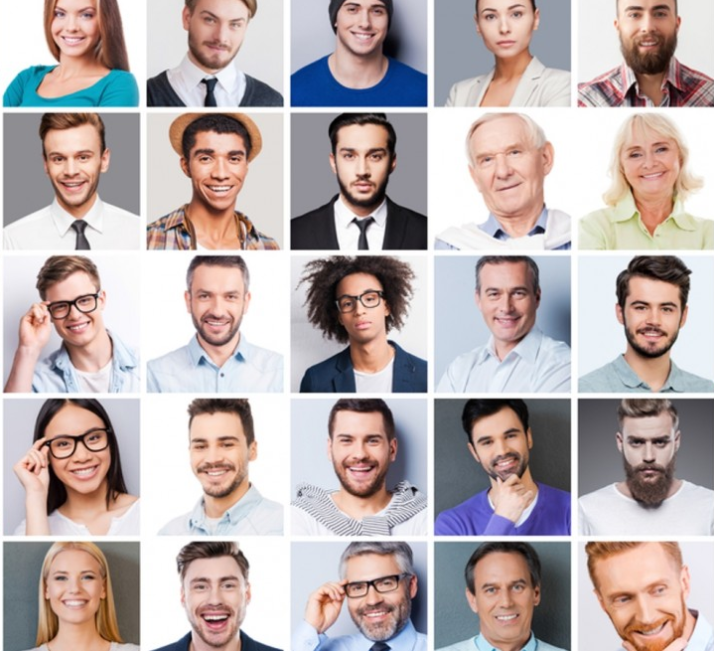 Given what we know about the very consistent long tail of participation in voluntary challenges, this has a powerful conclusion – namely, half of all your ideas – and now we know, half of your value – comes from people who only ever contribute once or twice. With what implication? The criticality of playing at scale! Unless you’re using an efficient, for-purpose management system that makes it easy to handle large-scale inputs, you’ll end up throwing away most of your valuable ideas! Caveat: kindly don’t make the mistake of reading this as “all ideas have the same value.” They don’t, since there are always good and poor ideas. What the data shows is that ideas have the same likely (or probable, or à priori) value when they’re binned by contributor effort (head or long tail) or by contributor job title (modest or upper management). In other words, an idea from a very active participant is just as likely to be useful as one from a rare contributor, or an idea from an Assistant Clerk is just as likely to be useful as one from a Senior Vice President. Many more data-based insights coming soon!